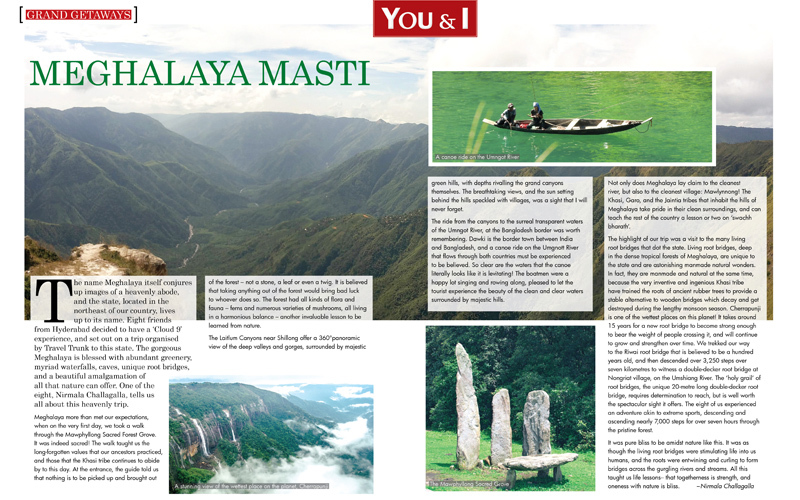 The name Meghalaya itself conjures up images of a heavenly abode, and the state, located in the northeast of our country, lives up to its name. Eight friends from Hyderabad decided to have a ‘Cloud 9’ experience, and set out on a trip organised by Travel Trunk to this state. The gorgeous Meghalaya is blessed with abundant greenery, myriad waterfalls, caves, unique root bridges, and a beautiful amalgamation of all that nature can offer. One of the eight, Nirmala Challagalla, tells us all about this heavenly trip. Meghalaya more than met our expectations, when on the very first day, we took a walk through the Mawphyllong Sacred Forest Grove. It was indeed sacred! The walk taught us the long-forgotten values that our ancestors practiced, and those that the Khasi tribe continues to abide by to this day. At the entrance, the guide told us that nothing is to be picked up and brought out of the forest – not a stone, a leaf or even a twig. It is believed that taking anything out of the forest would bring bad luck to whoever does so. The forest had all kinds of flora and fauna – ferns and numerous varieties of mushrooms, all living in a harmonious balance – another invaluable lesson to be learned from nature. The Laitlum Canyons near Shillong offer a 360°panoramic view of the deep valleys and gorges, surrounded by majestic green hills, with depths rivalling the grand canyons themselves. The breathtaking views, and the sun setting behind the hills speckled with villages, was a sight that I will never forget. The ride from the canyons to the surreal transparent waters of the Umngot River, at the Bangladesh border was worth remembering. Dawki is the border town between India and Bangladesh, and a canoe ride on the Umgnott River that flows through both countries must be experienced to be believed. So clear are the waters that the canoe literally looks like it is levitating! The boatmen were a happy lot singing and rowing along, pleased to let the tourist experience the beauty of the clean and clear waters surrounded by majestic hills. Not only does Meghalaya lay claim to the cleanest river, but also to the cleanest village: Mawlynnong! The Khasi, Garo, and the Jaintia tribes that inhabit the hills of Meghalaya take pride in their clean surroundings, and can teach the rest of the country a lesson or two on ‘swachh bharath’. The highlight of our trip was a visit to the many living root bridges that dot the state. Living root bridges, deep in the dense tropical forests of Meghalaya, are unique to the state and are astonishing manmade natural wonders. In fact, they are manmade and natural at the same time, because the very inventive and ingenious Khasi tribe have trained the roots of ancient rubber trees to provide a stable alternative to wooden bridges which decay and get destroyed during the lengthy monsoon season. Cherrapunji is one of the wettest places on this planet! It takes around 15 years for a new root bridge to become strong enough to bear the weight of people crossing it, and will continue to grow and strengthen over time. We trekked our way to the Riwai root bridge that is believed to be a hundred years old, and then descended over 3,250 steps over seven kilometres to witness a double-decker root bridge at Nongriat village, on the Umshiang River. The ‘holy grail’ of root bridges, the unique 20-metre long double-decker root bridge, requires determination to reach, but is well worth the spectacular sight it offers. The eight of us experienced an adventure akin to extreme sports, descending and ascending nearly 7,000 steps for over seven hours through the pristine forest. It was pure bliss to be amidst nature like this. It was as though the living root bridges were stimulating life into us humans, and the roots were entwining and curling to form bridges across the gurgling rivers and streams. All this taught us life lessons– that togetherness is strength, and oneness with nature is bliss.